Thanks to the Historical Cost Principle of GAAP, products in inventory are valued at the cost they were acquired for (purchase price), not their retail or sales value. This is because while the product sits in the company's warehouse, it is not worth $500 because it has not been sold yet, only until the product is sold will the company realize a gain of $150. In simpler terms, only until a product is sold will a company realize sales of $500, cost of goods sold of $350 and a gross profit of $150. This complies with the Revenue Recognition principle of GAAP. Another reason for valuing items in inventory at their cost prices instead of selling prices is that inventory cannot be sold without marketing effort. Until the marketing effort is fulfilled and the product actually sold, the company cannot increase its value of the inventory from $350 to $500. There can be exceptions made to this rule. An instance is for mining companies such as gold mining where no sales effort is required to sell gold and the substantial completion of manufacturing or mining of the gold allows the company to record gold inventories at net realizable value which is the selling price minus the cost incurred to dispose off the product. Other mining companies such as silver, platinum or copper manufacturers are also permitted to adopt this accounting rule. 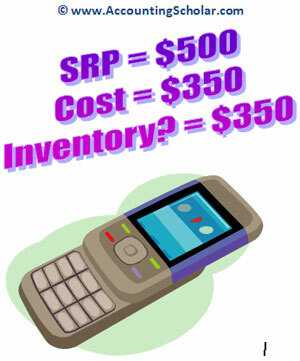 For indepth information on this, visit our chapter on Lower of Cost or Market for Inventory Pricing.